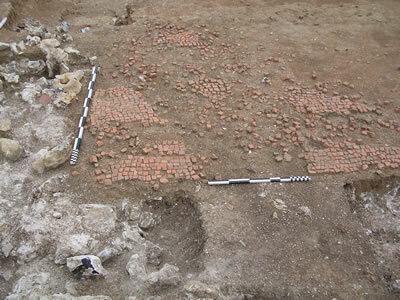 The 5 day course I attended in June is a fascinating insight in to what goes to make up an Archeological dig and the skills and techniques required to take an active part in excavations. 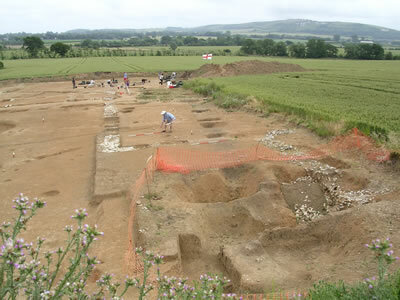 It is held at a Roman Villa site that was started in 2001 after a metal detectorist handed in his finds to the local museum. 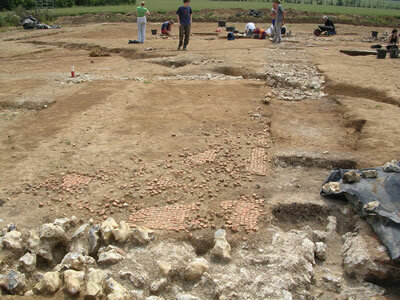 Click here for PDF file showing the amazing background and how the villa site has evolved since the digging began. 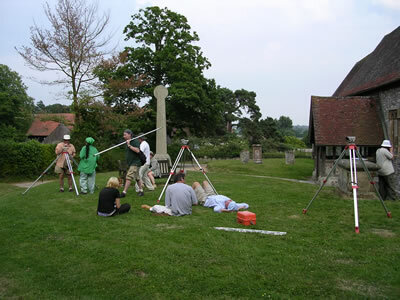 The set up that they have here is a model of detectorists and Archeologists working in perfect harmony together.In fact part of the course includes the use of metal detectors which students can practice with. At the end of the course you are issued with a certificate that can be used when applying to take part in other digs around the country. 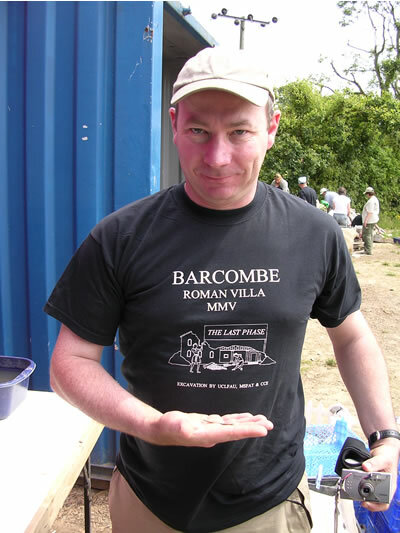 The amount I learnt was amazing and I thoroughly recommend that every detectorist should take the opportunity to attend one of these courses if they can. I have put together a daily diary so that you can see the kind of subjects covered during the week. They are running the same courses next year so check out there page, it only costs 150 pounds for the 5 days training. 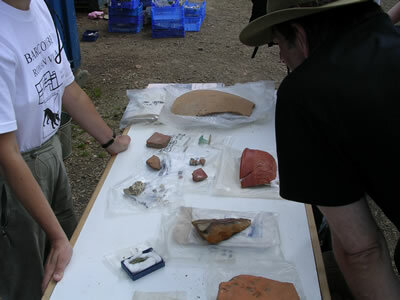 Discussion session on previous years digs and observations made. The Villa is a Classic Romano/British design with the gallery and two side rooms. Classic position of a villa near road and river transport and also wood for timber and charcoal. 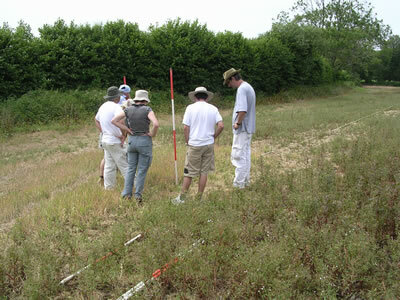 Discussion and hands on use of the types of equipment that can be used to aid the dig, Magnetometers, Metal detectors, Dowsing, Bowsing and Geophysics etc. The first type of equipment available is the Receptivity Meter. 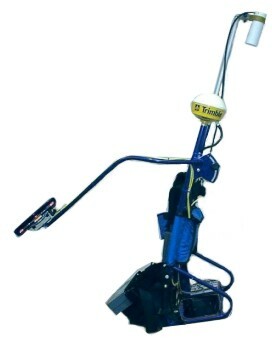 For most amateur groups, it is the most commonly used piece of equipment as it is both the cheapest and easiest to use. The hardware usually consists of a box of electronics mounted on a carrying frame, with wires leading down to a pair of metal spikes that are inserted into the ground. An electric current is passed through the ground and the box measures the resistance to the electrical current passing through the ground, hence the name resistively meter. The amount of resistance is affected by how much moisture there is in the soil. If there is a lot of moisture in the soil, you will get low resistance as the electric current passes through the wet ground easier. Conversely, if there is little moisture, then there is high resistance to the electric current. The problem with this setup is that the resistively is also dependent on the amount of contact the metal probes have with the ground, so most meters have a cable running to additional set of fixed probes that help it work out how much contact resistance there is. 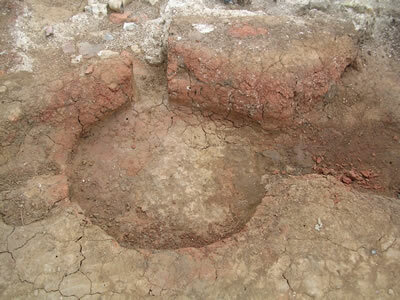 The amount of water present in the soil is affected by some archaeological features. For example, if you have a wall under the surface, then there is less soil to store moisture, which will evaporate quicker, making that patch of ground high resistance. Conversely, if you have a ditch or pit, it can store more moisture for longer, giving a lower resistance. 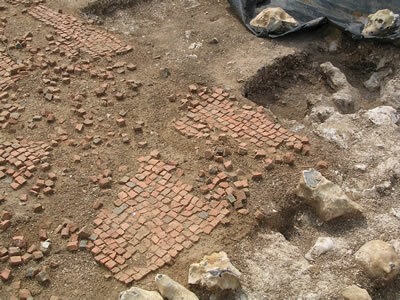 Resistance readings taken in a grid can then be turned into an image and interpreted to look for relevant archaeological features. The problem with resistively is that results can be rather poor if the ground is too wet or too dry, i.e. if there is little relative difference between the resistance for different depths of subsoil. 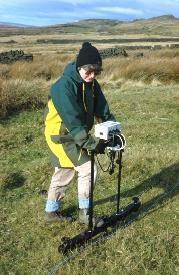 The second most commonly used piece of equipment is the magnetometer. It is rather more expensive and tricky to use, but is favorites with a lot of people because you can do a survey with a magnetometer a lot quicker than with a resistively meter. Magnetometers measure the local magnetic field strength. 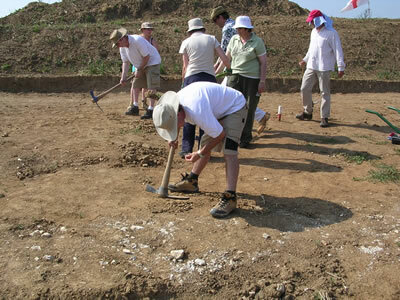 As well as the earths magnetic field, some archaeological features have a measurable magnetic field. 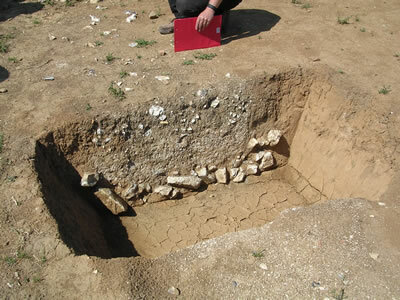 Burning will cause substances to become magnetised, metals such as iron have a strong magnetic field, and even the fill of a ditch will show up because there are magnetic particles in soil, so if you have a deeper depth of soil because of a ditch, you will get more of a magnetic field to measure. We plotted a 20m sq. grid to perform the Geophysics on and took readings at every meter. 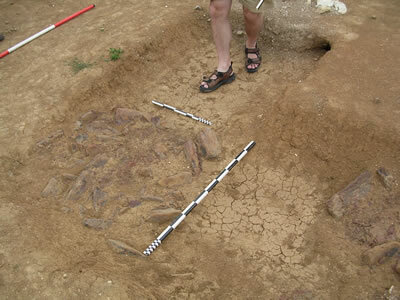 It soon became apparent that we were finding a large wall foundation due to the high resistance. 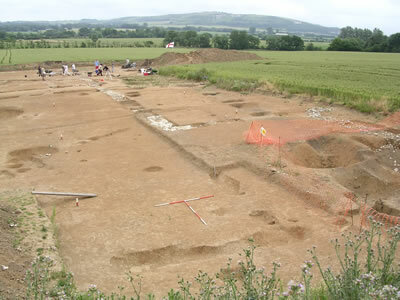 The field we selected had already had a full survey completed and they believe it is a 2nd Roman bath house that will be excavated next year as part of the continuing dig. The device can be linked to a PC and the software will draw the plots for you. A metal detector was demonstrated and guys could have a go themselves. Health and safety on site covering machinery, digging plant and hard-hats. 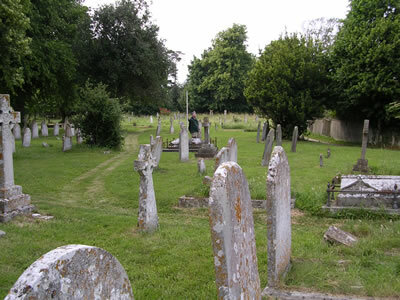 Selecting the right digging equipment for the site, it's location, access and size is critical as it is an expensive exercise. Caterpillar machines have to be towed to the site and require trucks to take the spoil back and forward to the area that is it dumped. They have the ability to rotate 360 degrees and are very quick. The JCB can be driven on the road to the site but uses only it's rear bucket so it does not drive over the cleared area. They are a lot slower at removing the top soil to get down to the Archaeology. 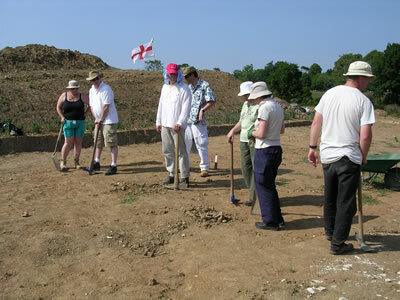 We were then shown all the basic hand digging tools used on the site including mattocks, picks, trowels, brushes etc. 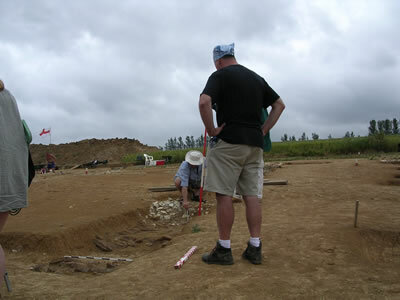 We were shown the correct use of the tools and finally let loose on the excavation site with strict supervision. 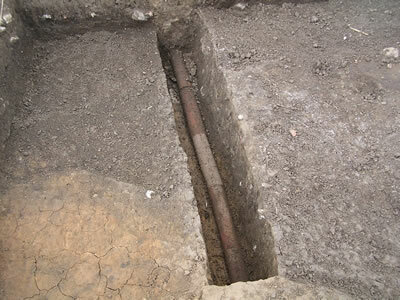 As we troweled a large area together we started to uncover a series of post holes that ran parallel to one of the main walls and it is believed they are a covered way. 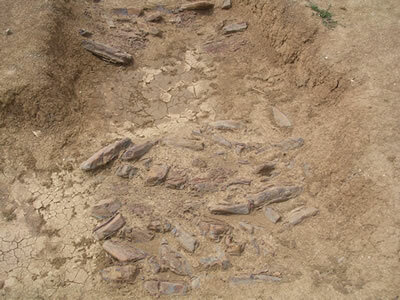 Even within quite a small area we uncovered Roman pottery and animal bones. 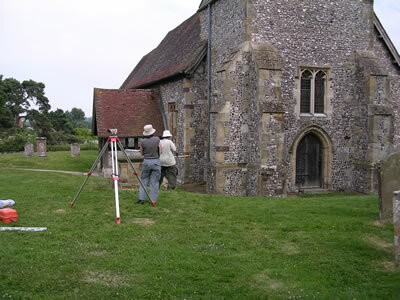 Use of a dumpy level and plotting a site. The afternoon session is back to practicing your excavation techniques buy working on a Roman bath house flint wall foundation. On a dig like the one at Barcombe a full time finds supervisor is employed. 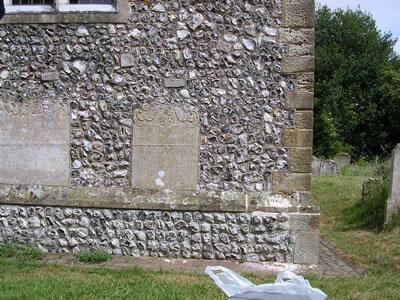 They need to be well organised and a good supervisor.If the site is waterlogged then a full time conservator is required. 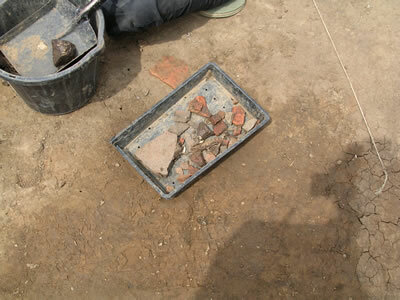 The course explains all the types of pottery finds made and you get to handle the different types, Roman box flue, floor tiles, pots etc. 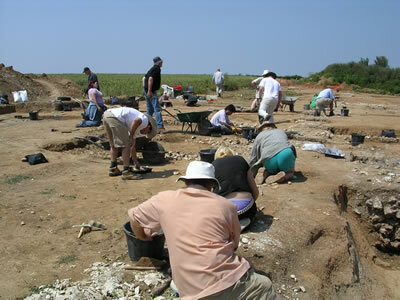 The type of firing and temporizing agents helps to identify the find, i.e. 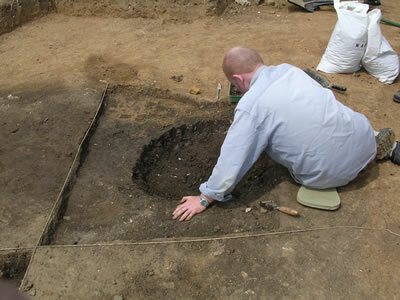 low fired can be prehistoric and Saxon.The cleaning methods used are generally cold water and a tooth brush. 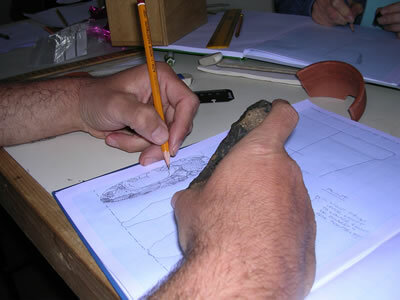 An important aspect to the finds is recording using the site context number and numbering of the find with a felt tip pen. 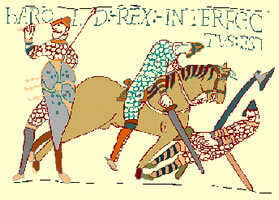 Glass - wash and mark glass, particular care with Medieval glass that must be kept damp to prevent drying and cracking. 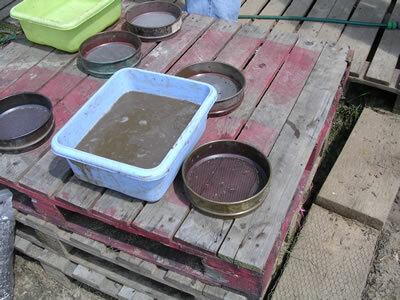 Leather - recreate the burial conditions and pack in tub and place with soil. 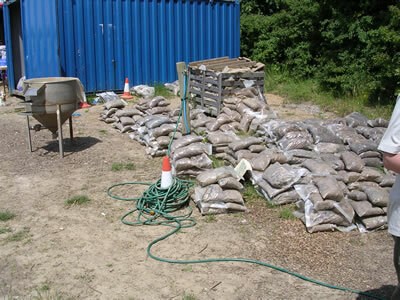 The final season the day is to process bags of soil samples taken from the site by using various graded grid meshes and water to capture the various finds. Charcoal, seeds, animal and fish bones, pottery etc . 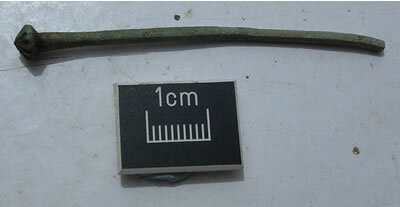 One of the guys was lucky to sieve out a complete decorated Roman pin. 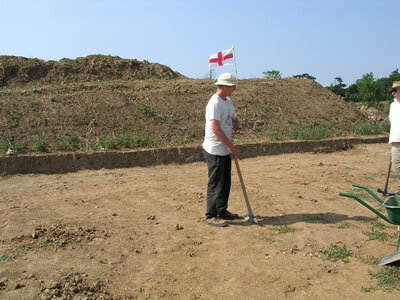 The first half day is back on site practicing our excavation skills on part of the Roman bathhouse wall. 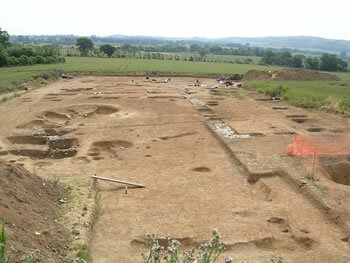 The afternoon session covers site drawing and records. 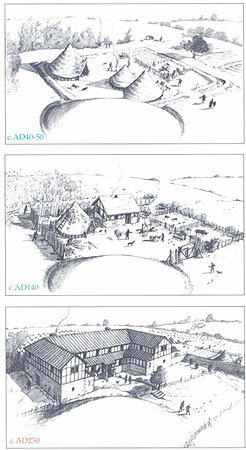 Pre excavation plans and section drawings. A practical exercise in the drawing the site of a church using a string level and plotting points onto graph paper. Use of basic drawing conventions, cross hatching etc. Techniques to draw pots and flints, use of the radius diagram. 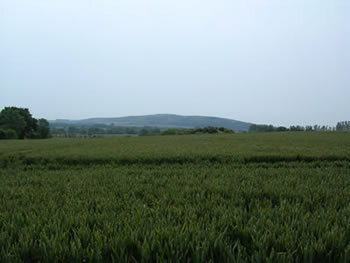 Presentation on the environmental and economic interest in the site. Animal Vegetable and mineral ( Flora, forna and Geo). 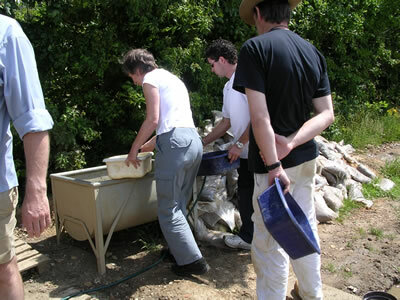 Normally 20 liters of soil is taken from a clean area for testing. The soil is sent to the lab for microscopic remains. Pollen survives in acid soil. Seeds might survive as fossilized ( found quite a few on day 3 during finds processing). If the ground is waterlogged then they need to be kept wet if excavated. Wood survives in waterlogged conditions or very dry conditions like Egyptian tombs. Final session is photography and using scales. to put on the top of grid pegs, so it doesn't hurt when you stub one! used because it rains when drawing!